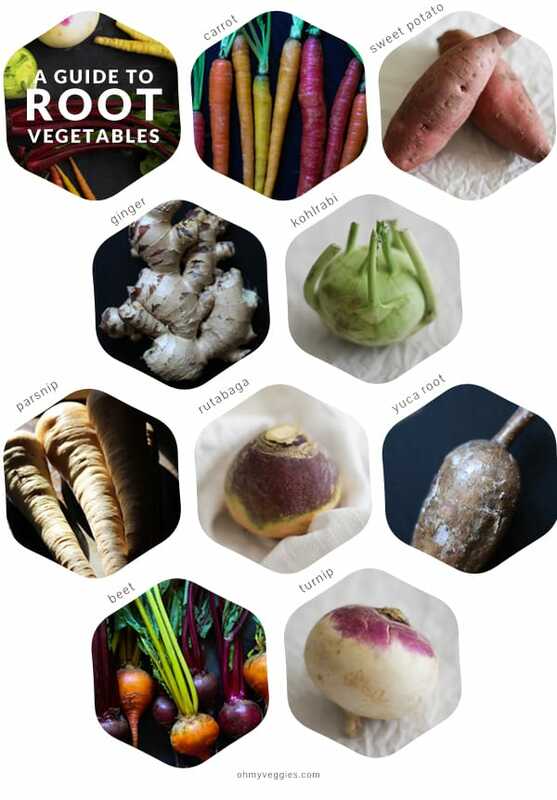 A Guide to Root Vegetables for Vegetarian Cooks from Oh My Veggies! Truth: root vegetables can be intimidating. Most of them have thick, strange looking skin and long stems with leaves sprouting out of them. Let’s face it, some of them look like they’re from outer space. Some root vegetables are given the cold shoulder because they have the reputation of tasting earthy and even bitter. But hold the phone. 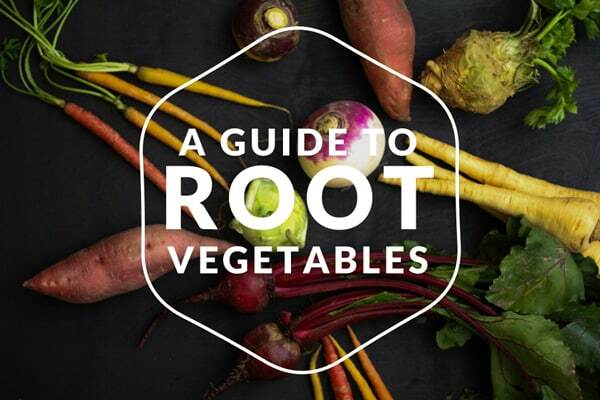 This guide to root vegetables can serve as inspiration to embrace the outcast extraterrestrial roots, as they are not only amazing for your health, but they are versatile in the kitchen and absolutely delicious when prepared properly. Because root vegetables grow underground, they absorb a great amount of nutrients from the soil. They are packed with a high concentration of antioxidants, Vitamins C, B, A, and iron, helping to cleanse your system. They are also filled with slow-burning carbohydrates and fiber, which make you feel full, and help regulate your blood sugar and digestive system. This factor, plus the high-octane nutrients and low calories, make roots excellent for people who are trying to lose weight, or simply stay healthy. Beets // Touted as a superfood, beets are among the healthiest foods on the planet. They’re full of beta-carotene and betalains, which are antioxidants and anti-inflammatory. Beets have an earthy, sweet flavor, and are best when roasted, steamed, or left raw and shredded. Golden beets are typically slightly sweeter than red beets. I find citrus (particularly oranges or clementines), blueberries, goat cheese, walnuts, ground cumin, cinnamon, and tahini are excellent compliments for beets. This Roasted Beet & Fig Salad is one of my go-to recipes. 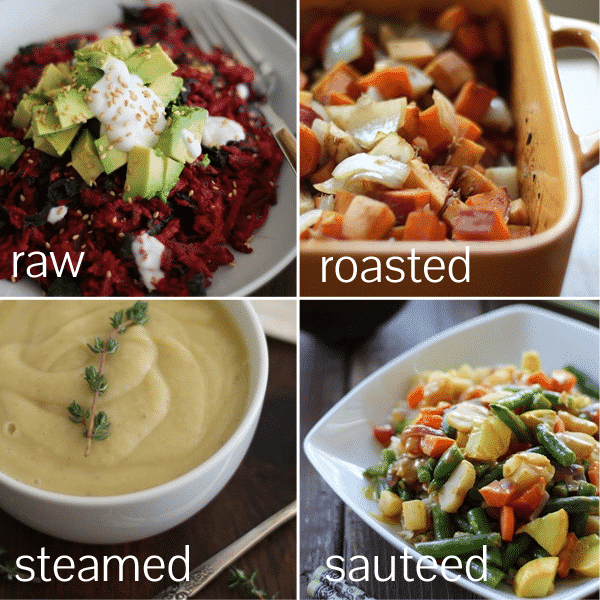 Roasted // Roasting any type of vegetable cultivates flavor and texture. Chop up your favorite vegetables, drizzle them with olive oil, sprinkle them with spices, and roast them in the oven. Balsamic Roasted Root Vegetables are an easy and delicious dish, and they’re a guaranteed way to get the vegetable-averse to eat and enjoy their veggies. You can also thinly slice roots, lay them on a baking sheet, and roast them into root chips. What about baking? Baked potatoes, baked yams? Potatoes are vegetables that grow underground as well. Brussel sprouts are fantastic grated, as well! What root veggie is very sticky when peeled? We grew it but don’t know what it is. We were told it was sweet potatoes but no way! Some of this information is inaccurate. Ginger, sweet potatoes/yams (as well as other potatoes), and onions are all stems. According to the biological classification system they do not fall under the criteria for roots, and we should not be promoting these misconceptions! We have the classification system for a reason. Lets use it. i have a root vegetable i would like to know what it is it looks like a radish/ carrot? long red but white towards bottom root tastes almost like mild radish. Thank you for this fine guide. I shared it with my small circle of peeps on my Facebook page, Cooking with Whole Grains & Real Whole Foods, and it was the most popular share all week. Pinned, etc., as well. I’m curious I was told by the doctor that I need to be eating fruits roots and vegetables I love potatoes so are potatoes a root? One thing I realized years ago, was that the soil that the vegetables were grown in is very important. One year, about forty, I think, my dad and I planted a new garden in an area that was all peat. Most grew to about twice the expected size. Carrots averaged twelve inches in length. There were a few small ones and a lot of big ones. Typically, when carrots get that big, they tend to have a woody core and poor taste. These were sweet and tender all the way through . I’m a big believer in the theory that vegetables absorb nutrients from the soil they’re grown in. Especially root vegetables. Many people don’t think about minerals and what they do for you.